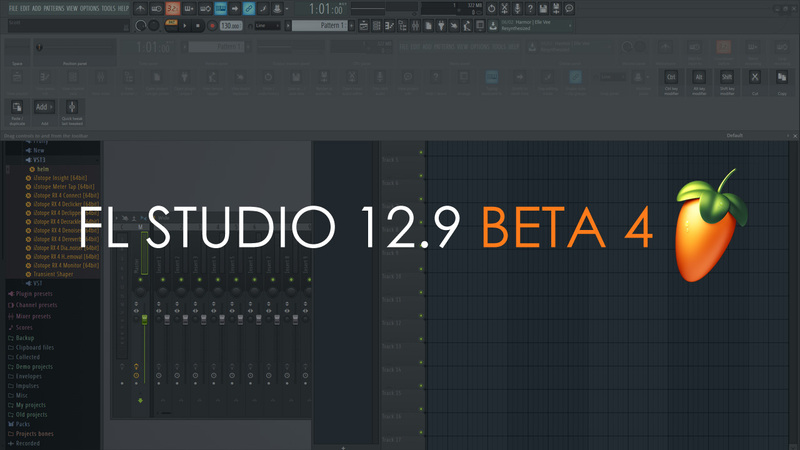 Get FL Studio 12.9.3 Beta 4 HERE! Updated Toolbar - New Toolbar design and editable layout. View > 'Test' - Options menu to run predefined tests for development and tech support. Mixer/Channel rack - Renamed the '(none)' preset used to delete generator and effect plugins to '(delete)' to help reduce confusion. Channel Settings - Renamed Sampler Settings option 'Load ACID markers' to 'Load slice markers'. Harmor - Visual feedback panel scaling oct/Hz scaling saved with the plugin settings. ZGameEditor Visualizer - New effects from Youlean: 'Blur', 'Motion blur', 'Bloom' and 'Color correction'. See what was new in Betas 1,2 & 3.